• Easy to use, medium capacity guillotines, ideal for home or office use..
• Self-sharpening hardened steel blade with smooth accurate cutting action. • Comes with built-in locking mechanism for extra safety. • Redesigned table area markings to improve accuracy of cut, including: paper and photographic sizes and scale bars in both mm and inches. • Transparent, folding safety guard for ease of storage and also aids lining up the cutting edge. • Handle remains in the upright position for extra safety and ease of paper positioning. • Certified for safety and quality (BS 5489: 1977). 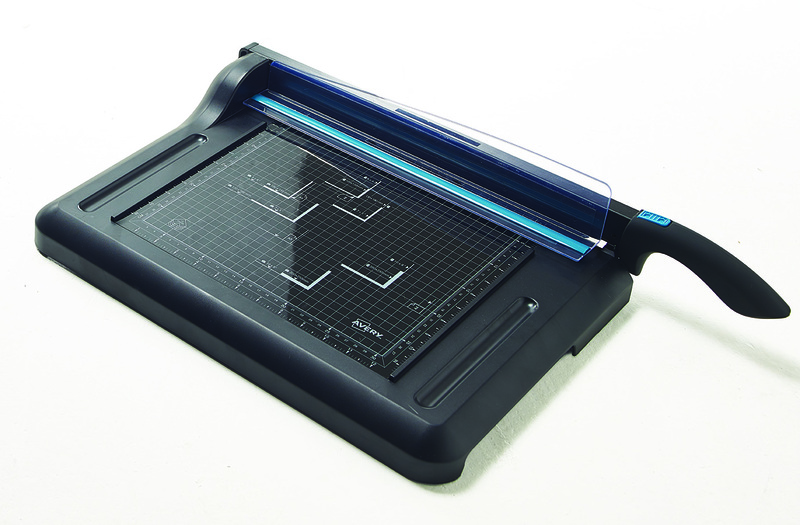 This lightweight Avery Office Guillotine features a self-sharpening steel blade, with a unique blade cover for safety. The guillotine also features printed guides for accurate cutting. This A4 guillotine has a cutting length of 310mm and a capacity of up to 15 sheets of 80gsm paper.